Innovative crown release system (patented) at 8 o’clock for easy time and date setting. 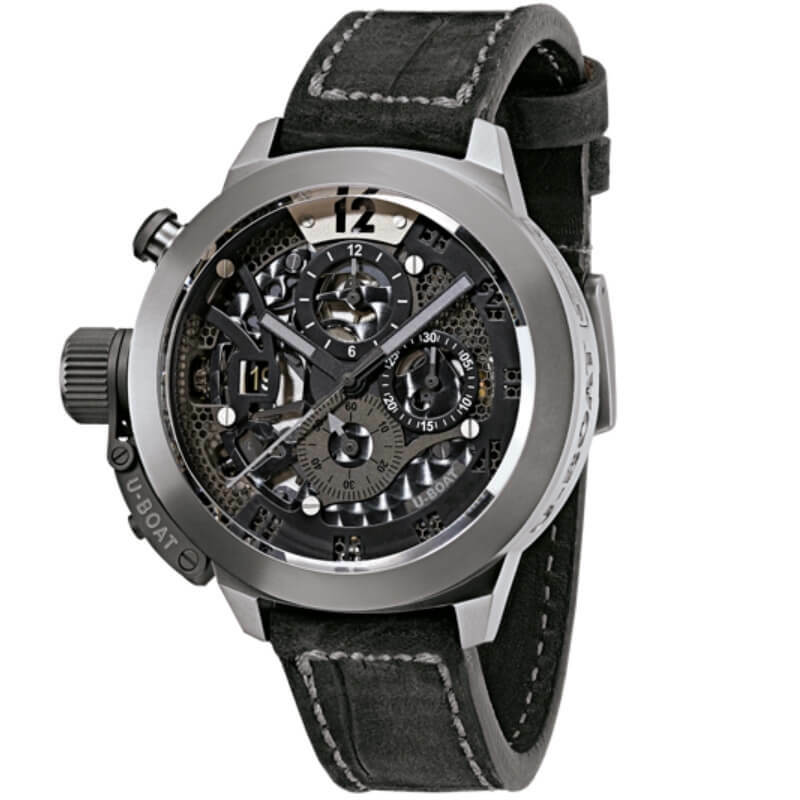 Automatic chronograph, personalized to U-BOAT specifications for date window and stem to be positioned at 9 o’clock. 28,800 vibrations per hour, 4 Hz. Power reserve: 38 hours. 25 jewels. Laser cut rotor as by U-BOAT specifications. Hours, minutes, seconds, chronograph, date. In titanium, 45 mm diameter. Bezel ring in matt tungsten. Distinguishing crown on left side, with a patented protective device . See through, sealed with 7 external screws, U-shaped sapphire fumé glass, showing the movement. Three superimposed skeleton dials, with superluminova grey hands. High quality sapphire with antireflection coating. Hand made and hand finished alligator leather, width 20/20 mm, with titanium tongue buckle.